General James “Mad Dog” Mattis is a revered legend of the United States Marines who has earned respect from all branches of the United States military. As a Marine for more than 40 years, General Mattis has been involved with numerous wars that were waged involving the U.S. Including the first Gulf War, where he led a battalion of Marines in 1991. 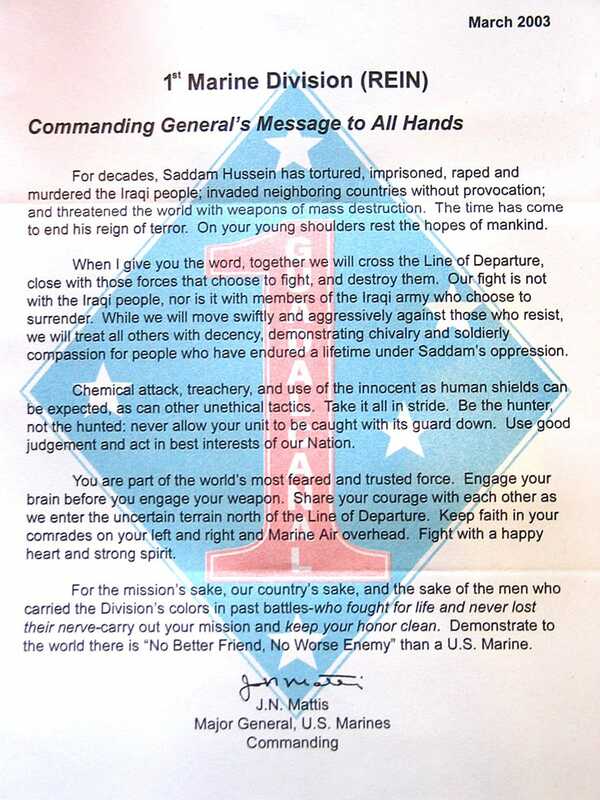 Later, in 2003, General Mattis wrote a letter to the 1st Marine Division, prior to the assault into Iraq on March 19, 2003, motivating the Marines to fight for the United States and the cause as well as the fellow Marines standing beside them. For decades, Saddam Hussein has tortured, imprisoned, raped and murdered the Iraqi people; invading neighboring countries without provocation; and threatened the world with weapons of mass destruction. The time has come to end his reign of terror. On your young shoulders rest the hopes of mankind. When I give you the word, together we will cross the Line of Departure, close with those forces that choose to fight, and destroy them. Our fight is not with the Iraqi people, nor is it with members of the Iraqi army who choose to surrender. While we will move swiftly and aggressively against those who resist, we will treat all others with decency, demonstrating chivalry and soldierly compassion for people who have endured a lifetime of oppression under Saddam’s oppression. Chemical attack, treachery and use of the innocent as human shields can be expected, as can other unethical tactics. Take it all in stride. Be the hunter, not the hunted: never allow your unit to be caught with its guard down. Use good judgement and act in best interests of our Nation. You are a part of the world’s most feared and trusted force. Engage your brain before you engage your weapon. Share your courage with each other as we enter the uncertain terrain north of the Line of Departure. Keep faith in your comrades on your left and right and Marine Air overhead. Fight with a happy heart and strong spirit. For the mission’s sake, our country’s sake, and the sake of the men who carried the Division’s colors is past battles-who fought for life and never lost their nerve-carry out your mission and keep your honor clean. Demonstrate to the world there is “No Better Friend, No Worse Enemy” than a U.S. Marine.